Since I last posted, I've made some real changes in my life. I've become a full time health coach and narrowed my focus to healthful living through plant based nutrition, vegetarian cooking, and other lifestyle choices along with a positive mental outlook. While that may not seem narrow in this world of ultra niches, for me it's a real reduction. Before I was a photographer, videographer, graphic designer, printer, and more. While I am still all these things, they all relate to the same subject now and that has really taken a burden off my life. Ok, ok, enough about me. What about FOOD! So, I've been working on a new cookbook that is low FODMAP and gluten free. Not that I am exclusively gluten free myself, nor do I buy into the fads out there, but there are enough people who need to reduce their wheat consumption and have intolerance to gluten. Here's a recipe from that upcoming book. Like traditional, soft and delicious. Can make into muffins or mini-loaves as well. See below for freshness tips, VERY important! Combine all dry in a large bowl. Combine wet ingredients well and stir into dry. Mix quickly and well, pour into prepared loaf pan and bake at 350°F for 40 to 45 minutes. 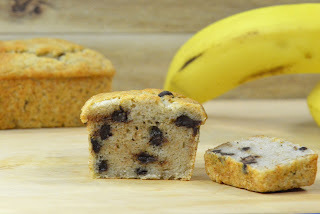 I like making these as mini loaves as seen in the picture. Freshness Tip: Freeze any breads, muffins, or cake you don’t use right away. All breads and cakes store best frozen even for just a few days. Just pull out the day before you want to eat it and leave UNWRAPPED to thaw. Many gluten free items go soggy if you leave them to thaw in a bag. I have found two problems, gluten free items go too dry or way too wet! To learn how to cook plant based and gluten free visit our website.